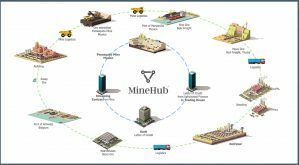 VANCOUVER – MineHub Technologies and IBM announced on Jan. 16 a collaboration to use blockchain technology to help improve operational efficiencies, logistics and financing and reduce costs in the high value mineral concentrates supply chain – from mine to end buyer. Goldcorp, ING Bank, Kutcho Copper Corp., Ocean Partners USA, and Wheaton Precious Metals are working with mining technology company MineHub to build the new mining supply chain solution on top of the IBM blockchain platform. The first use case will be built on the MineHub platform and will manage concentrate from Goldcorp’s Penasquito mine in Mexico throughout its path to market. When ore is mined, the mining company will upload data, including sustainability and ethical practices, allowing independent verification from regulators to end users as required. When materials are loaded for transport, the MineHub platform can record each transaction and allow permissioned parties to view and reconcile information throughout its journey. Smart contracts for supply chain processes such as trade finance, streaming and royalty contracts will be used by companies such as Wheaton Precious Metals and other institutions who provide credit facilities such as ING Bank in connection with the Penasquito mine. Visit www.MineHub.com to learn how blockchain technology can help lower costs.